I like it... more importantly my horse likes it.. and I’m glad I got the X large . It fits my average size horses head perfectly . I’m glad I read the other reviews to learn that . I like how the mask is designed, but it runs small. I bought the XL for our 17-h Standardbred, and it barely fits. I wish it was a brighter color so that it was easier to find when he slips out of it. The halter feature made this even more awesome. 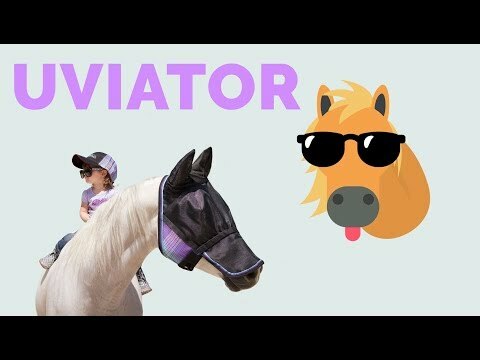 The coverage is wonderful and protects my horses eyes. These masks look perfect. Unfortunately I ordered the wrong size and need to return them. Placed a 2 nd order for the right size. Wonderful protection at a great price. The halter connection is a nice plus. Fit is small until the oversized. Sunglasses for my ERU Appy! Great fly and sun protection. I haves a pink skin, thin skin horse who's face burns without protection. She does not like the suntan lotions. I am hoping to reduce the use of suntan lotion by using this face mask. I hope it will protect her muzzle well. BEST ANSWER: I am not sure- it would depend on the size of the head of your horse. My buddy is a Tenn .Walker with a big head so I always worry the regular anything will not fit him. This was a little short on him but it is really nice- just wish the nose was longer for him. Sorry I am not much help. I have a Lusitano so I got regular size. Best mask I ever bought! I'm having problems with a couple fly masks I've bought bending in and touching the eye so the horse cannot open them. Is this material durable enough to stay out around the eye? BEST ANSWER: The material is flexible so what you are saying is possible but I am not experiencing that issue. I really do like this fly mask. I just make sure nothing is inside out (eye dimples) when I go to put it on. Seems to hold its shape well. The material for this mask is fairly stiff, so it stays away from the eyes quite nicely. What size is horse size in the fly masks, lg or med? Large is for a average horse. See size chart.